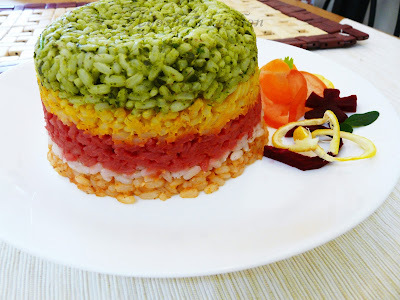 Layered rice/rainbow rice, the name itself speaks about colorful layers of rice. This is a healthy, spicy, tangy and delicious recipe with all the goodness of different kinds of vegetables. This rice dish is loaded with nutrients which will be very helpful for moms to feed their kids. Here i used the carrot for orange color, moringa leaves and coriander for green color, beetroot for pinkish red and tomato for a pale red color. You can also add your favorite veggies, chicken or egg and make a twist. I used leftover moringa leaves instead of palak leaves and can also use green peas instead. Spices can be added to each rice portion according to our own taste and i just skipped adding more spices like cumin seeds, pepper powder..etc..A perfectly delicious everything in one bowl meal. Divide the rice into five equal portions. Set aside. I made five layers of rice, carrot-flavored, beetroot flavored, coriander and palak/moringa leaves flavored, tomato flavored and finally plain rice with few drops of lemon. You have to prepare each colored rice separately. First, let's start with green colored rice. So grind together coriander leaves and palak or cooked moringa leaves to a fine paste. Do not add water. Heat a pan with only a few drops of oil/butter ( for kids). When hot add the paste, saute for few seconds and then add one portion of rice to it. Add a pinch of salt and mix well. Transfer to a cake mold or any other molds. Press it with the back of a spoon. So coriander rice ready. Now prepare the carrot rice same as coriander rice and layer on the top of coriander rice. Next prepare beetroot rice, the same way, and layer on the top of carrot rice. Next is the preparation of plain rice. Heat few drops of oil, add the rice, then few drops of lemon juice and a pinch of salt. Mix well. Layer on the top of beetroot rice. Finally the tomato rice. Grind the tomato with chili powder. Heat oil and add the paste, saute for few seconds and then add rice and salt. Mix well. Layer on the top of plain rice. Press gently and spread the rice evenly. 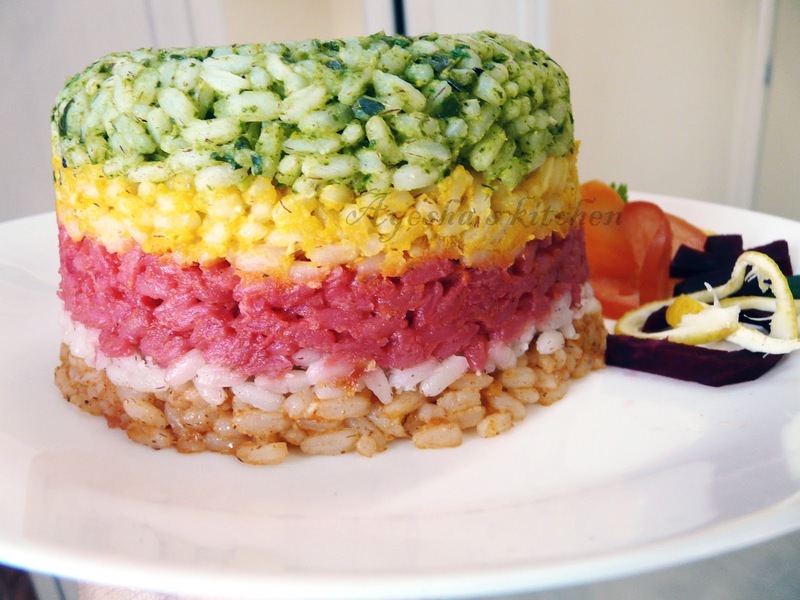 Flip to a plate and serve the rainbow rice with an omelet and a pickle. Yummyy!!! !